This is the next post in my series discussing what Phoenix residents can expect from the legal process after having been arrested for domestic violence. My last post explained what to do if an order of protection is filed prior to your case being resolved. In this post I will be discussing the pros and cons of accepting a pretrial diversion plea offer. I will explain what such a plea entails as well as why it is important to consult with an attorney prior to making a decision. First time domestic violence offenders often have more options than a person who has been previously charged with the offense. If the harm to the victim was not severe, and a firearm or deadly weapon was not used during the incident, then a first time offender may be eligible to defer prosecution. This can be an attractive offer because the purpose of a pretrial diversion program is to allow a person to ultimately have their case dismissed and therefore avoid having a criminal conviction on their record. Most city courts in Maricopa County offer pretrial diversion, including Glendale, Phoenix, and Scottsdale. In a pretrial diversion program a prosecutor negotiates with one’s criminal defense attorney and agrees to suspend prosecuting the domestic violence case. In exchange, the defendant must enter a guilty or no contest plea with the Court and complete a series of conditions required under the agreement. Conditions always include a series of domestic violence treatment programs (with classes and counseling, and often include such things as unsupervised probation, fines, and community service. Prosecutors will require that the defendant not be arrested for any other crimes during the period of unsupervised probation. If a defendant successfully completes all the requirements then the Court will dismiss the charges and no criminal conviction will appear on the defendant’s record (though a record of the diversion program may still exist). The catch to all of this is that f if a defendant does not complete all of the requirements then their guilty or no contest plea will be entered by the Court and the person will no longer have the option of defending the charges. This means the defendant will automatically go to sentencing, which may include a jail sentence because that is often a condition of the plea agreement. A pretrial diversion program can provide a second chance for Phoenix domestic violence defendants who made a one-time mistake. Such people often wish to prove that they can change and that they are taking the charges seriously. However, agreeing to such a program can be a mistake. Firstly, prosecutors usually try and entice a defendant to accept these offers as a way of putting an end to the case. The problem is that domestic violence defendants are often able to win their cases by fighting them; these types of cases are often the hardest for the prosecutor to prove. Also, even if a domestic violence defendant were to go to trial and lose, the potential penalties are usually the same (if not lighter) than the requirements of a diversion program (especially if they don’t compete the program). Secondly, if one is not prepared to make an effort towards completing the requirements then it is a big mistake to agree to entering the program. You are pleading guilty or no contest when you enter into such a program. This means that if one fails to satisfy the conditions then they are facing jail time, fines, and a loss of certain rights, such as owning a firearm. Pretrial diversion programs may not be the best option for a person who has difficulty making it to appointments on time, who can not reliably be trusted to follow through with commitments, or who has additional personal issues (such as a substance abuse problem). Such difficulties would place their deferred prosecution in jeopardy. 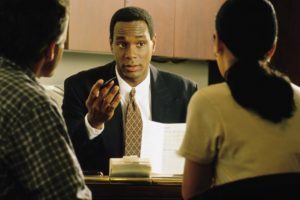 It is important that you consult with an attorney prior to your first appearance on domestic violence charges in the Phoenix or Maricopa County, Arizona areas. A lawyer can help you weigh the options of accepting a pre-trial diversion offer or attempting to defend the charges in Court. If you are a first time offender then you may have options that allow you to ultimately wipe your record clean. Contact my office today to schedule an initial consultation. I also represent defendants in Mesa, Glendale, Scottsdale, Chandler, and Gilbert and Pima County residents in Tucson.